There are many ways to entice fish to your bait and presentation. The basics would be sight, sound (vibration), and scent. Here is a combination that will enhance these basic senses. 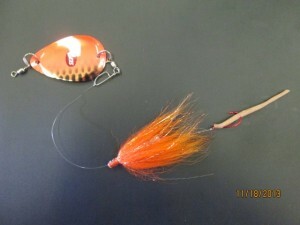 Seps Sidekick (copper/orange), Artic Fox Tube Fly (orange), and a Berkley Power Bait Trout Worm (natural). The leader length will vary 12-48″ depending on what setup you are using. Also, a crawler threaded on a straight shank hook would work well with this rig. There are many sizes and colors of dodgers to choose from and all of them will work on any given day. But the smaller teardrop ones are hard to beat. One reason these little dodgers work so well is they produce just enough flash and vibration to draw fish close without spooking them. 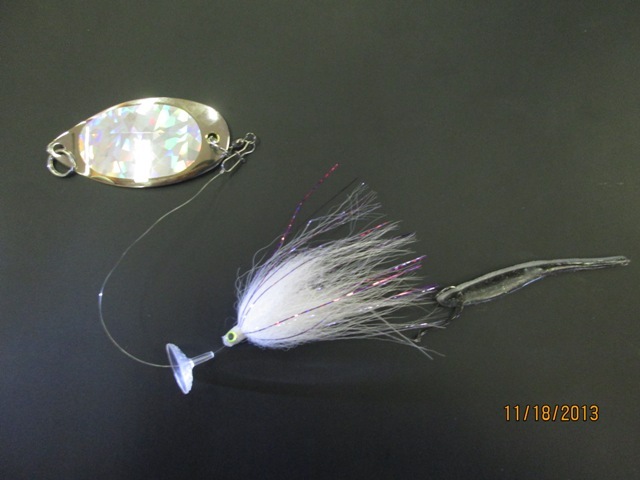 Glitterbug Teardrop Dodger (silver/ice), Artic Fox Tube Fly (white), Roboworm Alive Shad (hologram shad). Notice the Wiggle Disc infront of the tube fly. The disc will push water and give the bait an erratic action. There is also a bobber stop between the fly and the bait to keep the fly off of the bait. Sometimes in clear water a large dodger/flasher will spook fish and do more harm than good. As far as color selection goes, natural shad patterns work well on clear days, and painted dodger work best on cloudy days. But, it is good to experiment. Fish can be curious creatures and sometimes slam a bright color in clear water on hit a shad pattern on a cloudy day. Crystal Basin Wild Thing Dodger (green/tiger), Artic Fox Tube Fly (chartreuse), bead headed olive wooly bugger. Sometimes fish will come all the way to look at the presentation and not take the main fly. At this point they will have a hard time refusing the trailer fly. Buggers work good but so do nymphs and other wet flies. 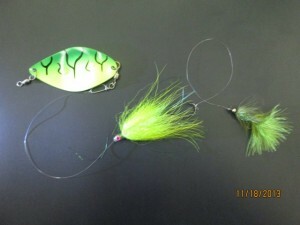 Trolling tube flies are awesome little baits and can be fish by themselves or used as an accessory. They are just hair tied on a tube but work great as an additional attractant. Also, the hair will soak up scent better than most materials. This setup is very simple and will hopefully help fill a limit.